Through many ups and downs, trade has been the link that has long fostered and maintained relations between Russia and Britain. The history of mutually beneficial commercial and cultural ties stretches back nearly 500 years since Ivan IV of Russia and Elizabeth I of England agreed to the foundation of the “Company of Merchant Adventurers to New Lands” in 1551. Renamed the Muscovy Company, the royal charter granted the company’s British owners the right to trade throughout Russia. It enabled the exchange of knowledge, skills, and goods that would benefit both countries for centuries to come. This relationship continued to bloom. Under the rule of Tsar Boris Godunov half a century later, foreign specialists were invited to raise the level of technology in Russia, and Russian students were sent abroad to study in European schools and universities, including Eton, Winchester, Oxford and Cambridge. The accession of Peter the Great in 1682 ensured that trade and diplomatic relations with Britain continued to be further strengthened. During the 19th Century and the days of the Great Game, as the British and Russian empires clashed over a struggle for supremacy in Central Asia, trade continued to flourish and the lines of communication remained firmly open. Even after the 1917 Revolution and the ensuing civil war, Britain was one of the first countries in the world to recognise the Soviet Union, in 1924. Close cooperation helped cement victory in WWII, but post war relations swiftly soured in the wasted years of the Cold War. Most of us firmly hoped those days were over and for nearly a quarter of a century there has been a period of seemingly ever-increasing interaction and warmth, and mutual economic benefit. But all this changed last year with frequent references in Britain and the west to a ‘new Cold War’. Of course it is necessary to report on the economic news emerging from Russia, the fiery political rhetoric emanating from all sides and the undoubtedly challenging geopolitical situation in Ukraine. But this focus risks encouraging a repeat of divisive past experiences, with countries, companies and individuals once again forced to choose sides with much finger-pointing and mutual political accusation. Economically the stakes are higher than ever, with bilateral trade running to billions of dollars a year. So the question arises: what should be done? Mutual business ties have suffered, set back almost to those distant days before the Muscovy Company. Russian companies, previously major players in London’s financial markets, have effectively been frozen out. Bilateral trade and business trips such as the Lord Mayor of London’s traditional visit to Moscow have been cancelled. British companies have been encouraged to stay away from Russia and from showcase events like the St. Petersburg International Economic Forum. 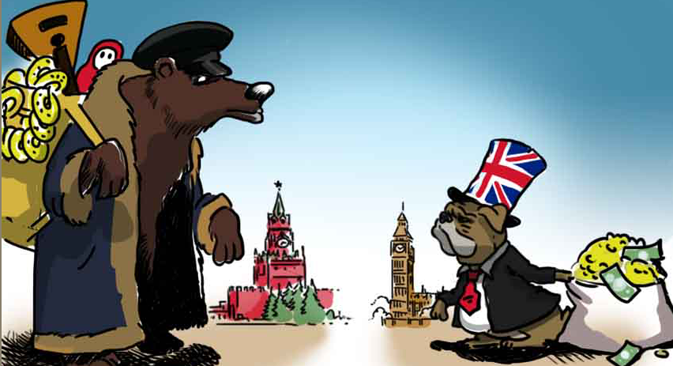 Russian companies are being encouraged to stay away from Britain, and instead to look East. A Russian-backed investment vehicle was blocked from buying energy assets in the North Sea by the UK government. The UK's department of trade removed a web page devoted to promoting trade with Russia as a “worldwide priority”. The list goes on. Is this what we want? Some say that “business as usual” cannot be allowed to apply. Many readers may feel that Russia must be held to account, and business must come in line. But this is ultimately a misguided view. Wherever one stands on the geopolitical debate, closing the doors to business not only hurts both sides, but also serves to close the doors of engagement, and removes the motivation to solve the wider problem. Behind the front-page news and headlines, investors and businesses yearn for stability and clear rules that will enable them to make investment decisions and keep trade going. Surveys of business leaders show that Russia is still a viable investment market, if it were not for the current turmoil. The UK and Russia’s long history of economic cooperation must be the starting point from which we seek to re-establish stability and work our way through the turbulence. It is the business community that must build on this strong vein of common interest. It is the business community that must ensure that 500 years of mutual benefit are not thrown away. Andrey Yakunin is a London-based investor and co-founder of VIY Management which facilitates investment in the Russian market and the CIS. He is also president of the St Petersburg State University’s alumni association.